William Kituuka Kiwanuka: THANK GOD FOR HON. JANET MUSEVENI'S LIVING BY EXAMPLE. THANK GOD FOR HON. 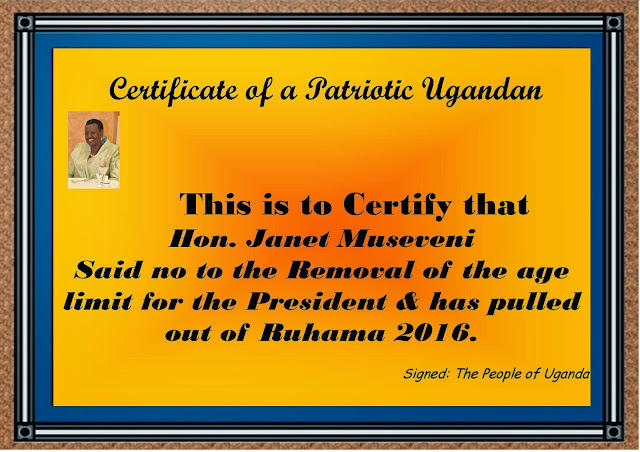 JANET MUSEVENI'S LIVING BY EXAMPLE. She said no to the removal of the age limit of the President of Uganda and has now said she will not stand again in Ruhama County in 2016. She deserves to be appreciated as one who loves her country and its stability, hence living by good example. She could easily qualify as woman of the year 2015. Praise the Lord.